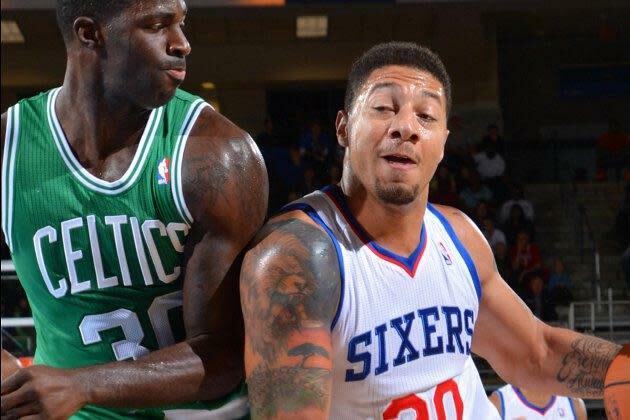 The NBA career of Royce White has been a complicated one, to put it mildly. A star in his lone season as a member of the University of Minnesota Golden Gophers Iowa State Cyclones, White entered the draft in 2012 and was selected by the Houston Rockets with the 16th pick. It was a potential steal — if not for White's openness regarding his struggles with an anxiety disorder, it's possible that he would have been one of the first five picks in the draft. Big forwards with passing, rebounding, and scoring skills don't come along very often. Unfortunately, White never found much common ground with the Rockets. Despite early signs that he and the team had reached an agreement on how to deal with his anxiety and fear of flying, White missed training camp (which, it should be said, was not thought to be a huge problem at the time), got into several disagreements with the team regarding what he perceived as their refusal to treat his mental health issues effectively, was suspended for "refusal to provide services" stipulated by his contract, and finally took his D-League assignment. Their relationship ended this summer, when the Rockets traded White to the Philadelphia 76ers. There has been hope that White would earn a spot on a Sixers roster desperate for any NBA-level talent it can find. However, as reported by Bob Cooney of the Philadelphia Daily News, Sam Moore of Calkins Media, and Elliott Shorr-Parks of NJ.com, White was waived by the team on Thursday as part of its last cuts before their season opener next Wednesday. The news comes as something of a surprise. As recently as the early hours of Thursday morning, Jason Wolf of USA Today indicated that White seemed likely to make the team based on head coach Brett Brown's hopeful words about White's future and the player's own business-like approach to his future with the franchise. However, Moore tweeted the excellent point that, with so few talented players on the roster and several players out for at least a couple months, the Sixers would need to employ people they could count on to play in as many games as possible, particularly if they were to continue to employ Kwame Brown for reasons only they seem to understand. White, for all his talent, has not yet proven that he can be that kind of player, and the Sixers may have wanted more of a sure thing. That said, it's as yet unclear exactly how much White's anxiety disorder played into this decision. Cooney, for one, believes that the biggest factor in his dismissal could have been his attitude, noting his ejection from a preseason game against this Monday. While ejections in meaningless games are not typically the biggest deal in the world when a player has lots of talent, it's true that White likely has a narrower margin of error than most players. For that matter, he has appeared to want to succeed in the NBA on his own terms, which is a perfectly valid stance in general but not always popular in a sports league that expects players to conform to its standard operating procedure. NBA teams have proven quite adept at avoiding any potential controversy or unwanted media attention. White, fairly or not, is a player who could complicate things for the Sixers. It is possible that another team will sign White (or that the Sixers will bring him back on a D-League deal), but a safer bet would be that he will have to prove himself at a lower level of competition first. Philadelphia traded "future considerations" for White, which would suggest that he was available to anyone who wanted him. After failing to make the roster of a team that could threaten the worst record in league history, it would seem that White's reputation is at an all-time low. He will probably need to play in the D-League or overseas if he wants to work his way back to the best league in the world. Or maybe White should spend some time considering if he even wants to play professional basketball. Since he was drafted by the Rockets, White has been very honest about his problems with NBA culture and the ways in which he wishes it were different. After failing to find a lasting home with two franchises, it's possible that he's just not a good fit for this employer-employee relationship. Recognizing as much would not be an admission of failure, but simply an acknowledgement that he, as a person, does not need the greatest possible success in basketball to validate his life.